It’s hard but that’s okay because you keep trying and then it becomes easier and then it becomes fun. That’s how you learn. This cool little quote is from my 5 year old daughter after ballet practice yesterday. Apart from the glaringly obvious growth mindset that she has at the moment, it made me start thinking about how my students would describe how they learn. At HPSS we have our Learning Design Model that was developed out of our deep exploration of the New Zealand Curriculum. This is the language that we use to describe how learning occurs. We envision learning as cyclical (not circular otherwise you go nowhere – in Di Cavallo‘s words!) rather than linear. The large coloured words are the different phases, smaller coloured words the types of things you might do at that phase (roughly going from shallower at top to deeper versions at the bottom) and the black words on the outside are the contexts this might occur in. At the heart of it all is critical reflection and evaluation. This is regular and ongoing rather than an add-on at the end of a learning cycle. This is the language that we aim for our students to use to describe their learning. As we went through last year we found that many students were able to do this very well. It was incredible hearing some students talking about their learning goal being to generate more ideas to allow their refining to be a better quality. Many teachers visiting the school were blown away by how well students could describe their learning and the purpose behind it. Not all of the students were completely fluent with this language of learning however. In a critical reflection of the state of learning modules, our Specialised Learning team identified that teachers were all not using the language to the same degree either. This has become our aim for Term 1 of this year. 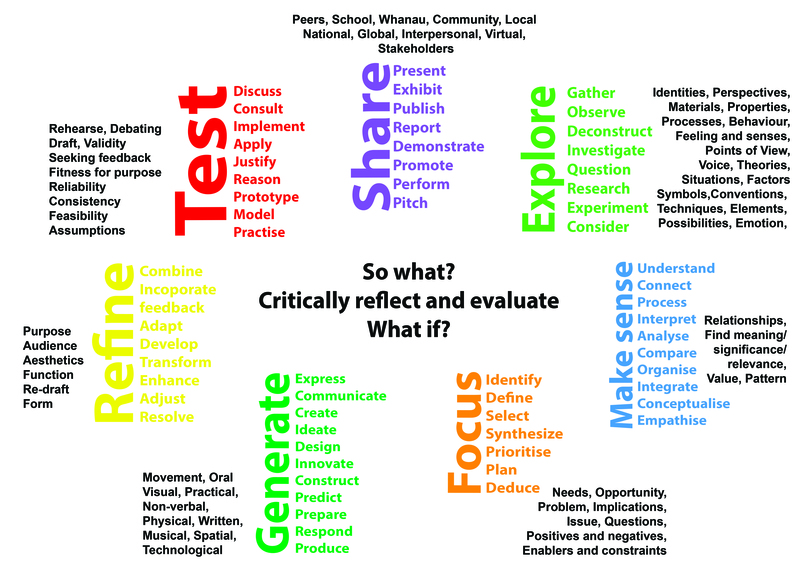 How Might We empower learners through visible and explicit thinking and learning? At present teachers have a great coverage of the concepts and skills required for each term. This isn’t always shared well throughout the term so we want to develop teacher abilities to do this. The common language of learning is where we have started our focus with teachers sharing their already great practice on how they use the phases in tasks to help others who are still developing this ability. Often in 2014, metacognition was left to our learning hub system. This year we want to see more regular reflection and evaluation of learning occurring as students progress through their modules. Collaborative planning is a real strength of our HPSS model. The improved iteration in 2015 is more regular checks on how the planning is going. Through both Specialised Learning Leaders and through Learning Area specific planning sessions. Our HPSS students proved the power of a common language of learning in how most of them used this language fluently to explain their learning. Term 1 2015 is about the next iteration. Empowering learners with all teachers using the same common language; developing their ability to use this language to evaluate their learning rather than just describe or explain; a sharing with students where in the curriculum their specific concepts, contexts and skills are coming from and what they build towards next. Sounds a pretty lofty goal for this term. That’s the point though – warm and demanding. This entry was posted in Uncategorized and tagged #28daysofwriting, HPSS, inquiry, language, learning, Learning Design Model by stevemouldey. Bookmark the permalink.